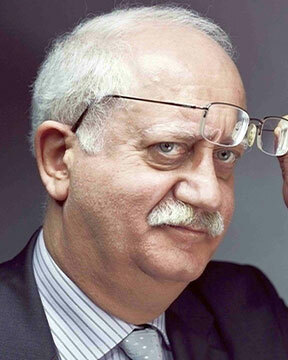 Prof. Christian Amatore, 66, was educated at Ecole Normale SupÃ©rieure (ENS), the leading French center for higher education and research. Acting as Director of the Chemistry Department of ENS as ENS Professor of Chemistry-the position formerly held by Louis Pasteur- he brought ENS back into the global spotlight for chemistry by designing the present configuration of its Chemistry Department to encompass a range of chemical fields from theoretical physical chemistry to bioorganic chemistry, with a special focus on chemical issues of importance in life functions. He is now Emeritus Director of Research in CNRS, Full Member of the French AcadÃ©mie des Sciences where he served as a vice-President in charge of Education, Foreign Member of the Chinese Academy of Sciences, Member of the Academia Europaea, Member of The Third World Academy of Sciences, Foreign Member of the Brazilian Academy of Sciences, Honorary Fellow of the Royal Society of Chemistry and of the Chinese Chemical Society, Honorary Member of the Israeli Chemical Society, Distinguished Scientist of the French Chemical Society, Fellow of the International Society of Electrochemistry and of the Electrochemical Society, President and now Past President of the International Society of Electrochemistry. Over the past years, he has acted as one of the twenty members of the High Council of Science and Technology, which advised the French Government on scientific matters. He has been thrice knighted by the French Republic in the National Orders of Merits and of Legion d'Honneur for his scientific achievements, and in the Order of Academic Palms for his deep involvement with scientific education in universities as well as in schools from elementary to high school levels. In addition to the list of impressive honors above, Amatore received many important French and international awards and medals, among which are the Silver Medal (CNRS), the Reilley Award (SEAC), the de Broglie Medal (Academia dei Lincei), the Bourke Medal (RSC), the Galvani Medal (SCI), the Breyer Medal (RACI), the Heyrovsky award (Charles University, Prague), the Faraday Medal (RSC), and the Volta Medal (ECS). He has been distinguished lecturer in many outstanding universities (Royal Society (London), Oxford, Durham, Cornell, Pittsburgh, Prague, Caltech, Padova, Modena, Roma La Sapienza, Japan JSPS, Bologna, Bucarest, etc. 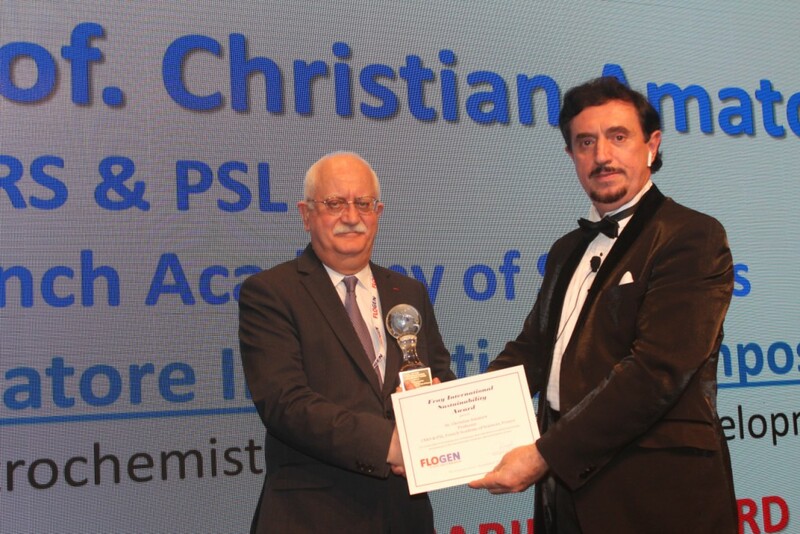 ), is Honorary Professor or Doctor Honoris Causa of several universities in Europe and Asia, and is now "Distinguished Visiting Professor" in the University of Xiamen in mainland China. 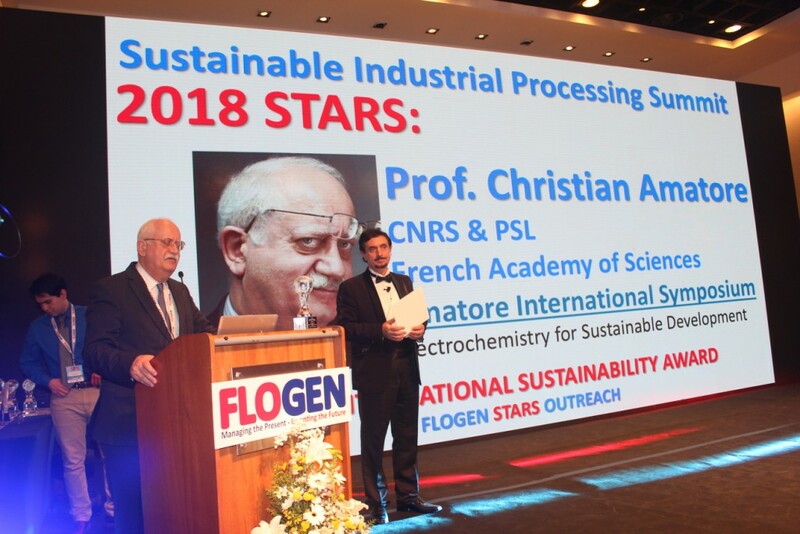 On April 11 2018, Prof. Amatore was awarded with the Lavoisier Medal, in recognition of outstanding services rendered to the sciences of chemistry. The award, which commemorates the work of Antoine-Laurent Lavoisier, represents the highest honor delivered by SociÃ©tÃ© Chimique de France (SCF) and is awarded once every five years. Amatore's research contributions are presently disclosed in 486 primary research publications cumulating more than 22000 citations and corresponding to a "h-index" of 74 (ISI Web of Science, December 2017) with an average citations rate larger than 1 250 per year over the past 5 years. Amatore's research has always been driven by curiosity. They are all characterized by critical thought, creativity, and an insatiable desire for understanding. His work has spanned fields as diverse as palladium catalysis, physicochemistry of neurotransmitter release by living cells and oxidative stress, as well as the development of experimental techniques centered around the use of ultramicroelectrodes and ultrafast cyclic voltammetry. This is sustained and complemented by very rigorous theoretical and mathematical treatment, which provides the framework to understand chemical phenomena and reactivity from both conceptual and experimental points of view. 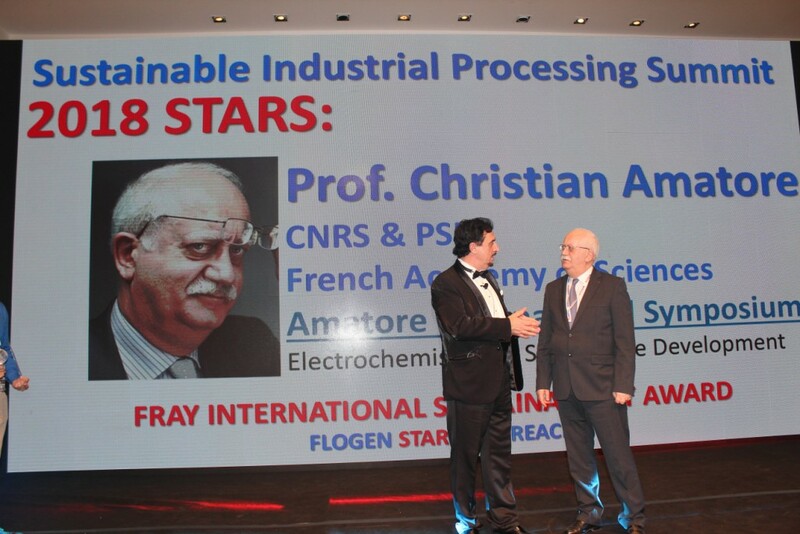 As a result, Amatore's work in both experimental and theoretical electrochemistry has impacted broad areas of chemistry, including inorganic, biological, physical, and materials chemistry, and has stimulated many new research areas in numerous laboratories around the world. These versatile aspects of Amatore's work and approach place him well beyond his main field of electrochemistry, and instead in a unique category as a chemist in particular, and as a scientist in general. In electrochemistry, he introduced new fundamental concepts and developed new tools, including micro- and nanoelectrodes that are routinely used in most laboratories around the world today. He rapidly recognized their tremendous potential to investigate/interrogate electrochemistry, and by extension, all of chemistry, with greatly improved spatiotemporal resolution. He thus embarked in a rigorous theoretical description and experimental demonstration of the development of methods for making well-defined and reproducible ultramicroelectrodes, as well as designing electronic circuitry for enabling the reliable measurement of the inherently small currents involved at ultramicroelectrodes. In this context, he developed ultrafast cyclic voltammetry, allowing kinetic measurements in electrochemistry to investigate time scales ranging from tens of seconds down to a few nanoseconds, beyond which classical electrochemical theories need to be replaced by quantum-based considerations. In his hands, these outstanding innovative tools led to important applications in chemistry, catalysis, and biology of living cells. Through his innovative electrochemical tools and concepts, and a series of systematic studies, he pioneered the field of the electrochemistry of organometallic systems, contributing in particular to unravelling the crucial role of 17- and 19-electron intermediates in the reactivity of homogeneous organometallic and inorganic complexes. This allowed him to introduce the concept of electron transfer catalysis of ligand exchanges at transition metal centered species. Finally, he could fully unravel the detailed and delicate mechanisms of the important palladium-catalyzed carbon-carbon coupling reactions, an important reaction class in organic synthetic chemistry as was recognized by the award of the 2010 Nobel Prize of Chemistry to its inventors, Profs. Ei-ichi Negishi, Richard Heck, and Akira Suzuki. His work established not only the unexpected and unique mechanistic backbone of these reactions, but also explained the high specificity of each of them. These seminal mechanistic studies offered simple experimental rules for optimizing homogeneous catalytic mechanism. A second major and outstanding contribution through its impact for the investigation of living cells and tissues at the micro- and nano-scale level was the introduction of the "artificial synapse" concept. Using this experimental paradigm, Amatore investigated the fine mechanism vesicular neurotransmitter release by endocrine cells or by neurons inside synapses. He also became rapidly interested in unravelling the release and the nature of the small primary reactive chemical species released during cellular "oxidative bursts", which are referred to as Reactive Oxygen and Nitrogen Species (ROS & RNS), or as Free Radicals- though most of them are not radicals. This led to the first quantitative molecular description of the fine interactive mechanism of hyperemia, which couples neuronal activity and blood supply by local vasodilatation in the brain through strong release of nitric oxide by neurons when they enter in activity. Through this work, Amatore could thus confirm a very old hypothesis made by CS Roy and C Sherrington in 1890 about the role of nitric oxide in brain behavior. Since then, he could develop extremely sophisticated nanoelectrodes to probe the extent of ROS and RNS dynamic production inside normal and inflamed living cells, with a particular focus on carcinogenesis. This introduction is only a very brief overview of the extremely large breadth of Amatore's innovative research, and those with the largest impact in the scientific communities were presented. To demonstrate his curiosity and versatility, one may think of his research developed in close cooperation with the Louvre museum to validate a long-time interrogation in Egyptian archeology, about the curative claims of the antic black eye make-up worn by antic Egyptians. Through his methods, Amatore was able to show that this make-up stimulated the eye-lids to generate nitric oxide fluxes, whose bactericidal properties prevented eye infections.